With 20 years of traveling behind me, I have thousands of photographs to choose from. 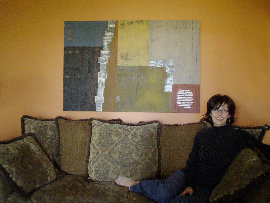 All of the photographs used in my paintings were taken by me. The photographs are selected for various reasons. It may be for a special memory, or a particular emotion I felt at the time. It might be because the shot is aesthetically pleasing to me. It is my hope that these paintings strike a chord with people who have been to these places or dream about going there. I would like to think it would be an everyday reminder of a great time that was had or a reminder of a goal for future travel.